Last summer we started talking about moving. There haven't been many particularly visible signs of progress on this topic since then, since we've been spending our time clearing the decks, documenting the house as it was, finishing up various other projects, and celebrating the holidays. But this week we took a major step forward: We have rented a new space, which will become the new office of Looney Labs, in the attic of a close friend who owns a house nearby. Here's what the space looks like at the moment: still mostly empty. As noted, the first thing we will be moving out of this house is the business we started here. One of the reasons it will be a big challenge for us to move is also one of the main reasons we really NEED to: our house is overflowing. We just don't have enough space for all of the desks and file cabinets and employees and computers and boxes of propaganda and game parts and half-built product and other inventory. So, we're going to start by moving the accounting/business office over to our new space. Kristin got the new high speed internet connection up and running yesterday, so it's time to start moving in! 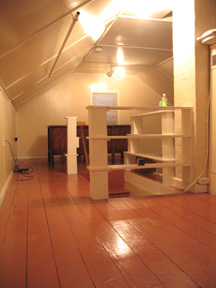 This attic apartment we're moving the business to is a long-term temporary solution. Because our business is our livelihood, we obviously need to make sure it can keep running smoothly during the chaos and upheaval of the rest of our relocation efforts. So, the first task is to set up a satellite office nearby, and to transfer control of the company to that. Then we can pack everything else up, figure out where we're going, and work on getting there, all without interfering with the regular running of the business. Eventually, when we're settled and ready, the business office will follow and move closer to our new home, and we can shut down the College Park office ... or maybe not. It will also serve as a place for us to stay when we're in town, and we may decide to maintain the College Park office apartment indefinitely. After all, with all the friends and family in the area, we'll often be traveling back here, so the idea of maintaining a small apartment in the area is appealing. On the other hand, if the Supreme Court actually does what it's supposed to do (which is of course to provide a check-and-balance over the other two branches of the government by striking down laws that go too far) then the case before them is a no-brainer. For me, if the Supreme Court refuses to halt the arrest and incarceration of medical marijuana users, it will be proof that there is corruption at the highest levels of our government. The whole entire job of those 9 people is to look at new laws, compare them to the original Constitution, and consider if those new laws fall within the limits of the government's power, or not. And I just don't see how anyone can think that the Founding Fathers would have supported laws that send people to jail for growing a plant which many of the Founding Fathers grew themselves. Do your own search on the text of the Constitution. You'll find material which, taken as a whole, asserts the legality of "intoxicating beverages" (which could be argued, it seems to me, to include cannabis tea as well as alcohol), but you won't find the word marijuana (nor any of its synonyms) anywhere in our nation's charter. The only way the Drug War has been justified up until now has been on the basis of the Constitution's "Commerce Clause," but there's absolutely no commerce when you grow your own and smoke it yourself! Marijuana prohibition is unconstitutional, plain and simple, and if the Supremes don't admit it now, they aren't doing their jobs. Sadly, however, I believe there IS corruption at the highest levels of our government, and I'm greatly worried that they'd rather uphold the status quo than upset the apple cart of the Prison-Industrial Complex. But I'm an optimist, and I do have hope, and we have a short list of US cities we're thinking about moving to as well, just in case. And one of these days, they'll make an announcement and we'll know! In other news, I had a root canal this week. It was my first, and it was pretty terrible, but I got through it. By the time I got into the dental torture chair, the whole area around the tooth in question had become swollen and puffy -- you could tell just by looking at me that I had a bad toothache. The root of the problem has now quite literally been removed, but I'm still battling the infection it left behind. I am gradually getting over it, though (yay for penicillin!) and I hope to be back to normal within a few more days. Have a Great Week! And Don't Forget to Play! "#18. All -- not some -- but all the voting machine errors detected and reported in Florida went in favor of Bush or Republican candidates." -- "20 Amazing Facts About Voting in the USA"